German performance sedan is set to receive some major changes for 2014. As the 2013 E-Class range hits the showrooms, Mercedes is working on the 2014 model year, which is expected to receive some major changes. The E63 AMG performance flagship model has been spied lapping the Nurburgring in prototype form, and like previous E Class test mules, the dual-unit headlights have been replaced by a single shape design and topped by new LED elements. Heavily disguised bumpers hint at an all-new design. Singling out the test mule as an AMG model are the newly styled quad exhaust tips. Oversized wheels and tires and beefy side sills also give it away, while other new E-Class features the E63 AMG will adopt include a more upright standing grille and a new hood. 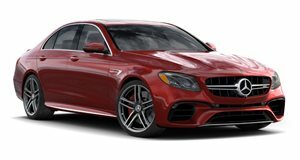 Minimal changes are expected under the hood as AMG&apos;s latest twin-turbo 5.5-liter V8 was only introduced two model years ago, which in the E63 produced 518 horsepower and 516 pound-feet of torque. Perhaps a bump in power is in order, to get it closer to the BMW M5&apos;s 560-hp potential. New safety technology will also feature on the 2014 Mercedes Benz E63 AMG. This will include advanced camera monitoring systems in the front bumper, used for enhanced pedestrian and animal detection as well as adjusting the suspension to suit the undulations of the road ahead. The new 2014 S Class will debut a similar system in addition to a congestion assistant (also expected to be shared by the new E63) that allows drivers to autonomously follow the car in front at speeds up to 40 mph. The debut of the 2014 E-Class range is expected in the coming months, perhaps in Geneva next March, with sales to start late summer.